To be completely honest, when I opened the box containing what I was told was a beta version of the Vaporcade Europa mod, I really wanted to hate it. Why? Because it forces you to use their proprietary “shuttles”, meaning that you’re locked into purchasing from them instead of using your own e-juice or tank. The shuttle lights up when you take a puff off the mouthpiece. The Europa is, according to Vaporcade’s marketing materials, the “next generation of mod”. You’ll find out why I personally hesitate to use the word “mod” to describe this vaping device in a little bit. The Europa is a small squarish-shaped device that is slightly larger than the palm of my hand. 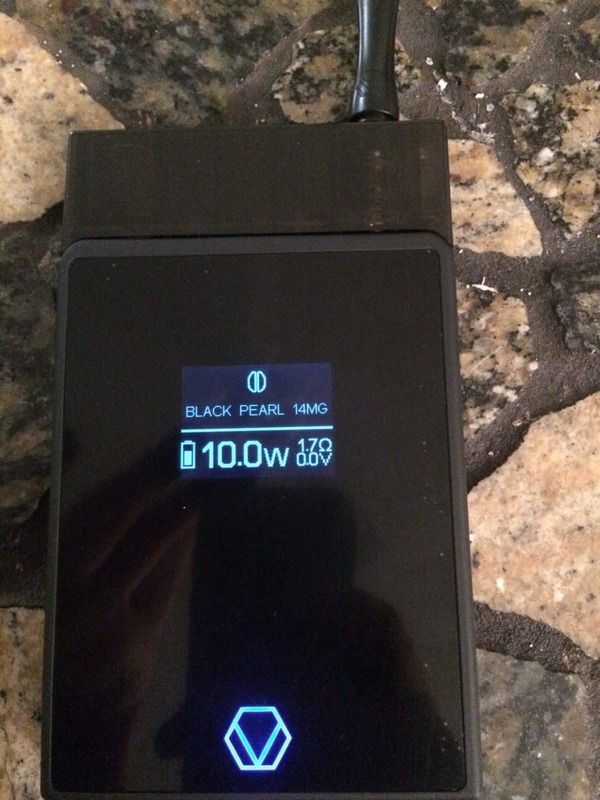 The front of the device is an LED screen that shows the wattage, ohms, voltage, and battery life, among other things. The left side of the device has a switch to turn it on or off, two buttons to adjust wattage, and a fire button. The bottom includes a micro-USB port for charging (with charging cable included), since it doesn’t use external batteries. The top includes a port to connect your “shuttle” to. To use the Vaporcade Europa, you’ll need to purchase their proprietary “shuttles”, which are small plastic cartridges that each contain one flavor of e-juice. Each shuttle also includes it’s own removable mouthpiece, which I found to be a little bit difficult to screw in. There’s no way to connect your own tank to this device, which is why I previously mentioned my hesitation about calling the Europa a mod. If you can’t modify it in any way, it’s not really a mod, is it? Additionally, my initial desire to dislike them came from this lack of ability to customize, and the fact that it just reeked of a businessman looking to create a “razor and blade” business model in the vaping industry. Case containing a “shuttle” flavor cartridge. ease-of-use and simplicity of the shuttle system makes this a great option for beginners. Using the shuttles is literally retard-proof. Simply open the package, snap the shuttle into the port on top of the vape, and insert the (difficult to screw in) mouthpiece into the shuttle and you’re ready to go. The screen on the vape even shows what flavor you’re vaping, along with the nicotine level and a little picture that represents the flavor (for example, a peach for the peach flavor). I actually sampled all five of the flavors that they have available, and they were surprisingly decent. The flavors all have weird hipstery names so I won’t type them out, but the actual flavors are peach, coffee, spearmint, raspberry, and apple. Each shuttle lasted me a fairly long time, and I was vaping on this thing constantly. The size of the clouds that the Europa produced were actually quite impressive. Card that comes in the box. Look, if you’re the type of person who participates in cloud-chasing competitions, builds your own RDA, and has 254 mods in your collection, let me be blunt: this isn’t for you. The Europa is for the beginner who wants to dip their toes into the world of vaping with something a little bit more advanced than a cig-a-like, but is too intimidated by using refillable tanks and box mods. I’ve always said that one of the biggest problems with the vape industry is that the barrier to entry when it comes to how much knowledge you need is too steep for most smokers to want to switch over. Sure, cig-a-likes are a great option for some smokers, but for most people it was the power and flavor options of mods that really inspired them to kick the habit. The Europa fits in perfectly as a bridge between cig-a-likes and mods, or for the slightly more adventurous smoker it would make a great first step away from cigarettes. I did experience an incident where the Europa was powered on, sitting down on my desk and it continuously auto-fired. I noticed it because the shuttle kept blinking, and when I touched it the thing was hot. It wouldn’t turn off when I flipped the switch, but once I removed the shuttle and put it back on the situation was resolved. So the fix was simple and it only happened once, so it may have been an isolated incident, but I feel obligated to mention it. smoking and are too intimidated by the complexity of most mods, I wouldn’t hesitate to recommend this to you. And if you’re an experienced vaper but know someone in a similar situation, you could do a lot worse than recommending the Europa.